This Yom Kippur, Marcia Schwartz, a recent graduate of the Jewish Federation’s Tanzman Fellows leadership development program, member of several Federation committees, and wife of Jewish Federation president, Jeff Schwartz, addressed congregants of her synagogue, Congregation B’nai Tikvah. In her remarks, excerpted here, Marcia described the ways in which the Federation and B’nai Tikvah have been working together to make a positive impact in the Jewish community at large as well as for B'nai Tikvah and its community, specifically. “In short: the Federation needs us, and we need them,” Marcia said. Congregation B’nai Tikvah is one of dozens of synagogues with which the Jewish Federation partners in similar ways to solve the pressing needs in Jewish life. Shana Tovah. As most of you know, my husband Jeff is the President of the Jewish Federation in the Heart of New Jersey. I am a recent graduate of their Tanzman Leadership Development program and I currently serve on several Federation committees. Jeff and I are proud to be among the group of B’nai Tikvah congregants who have held leadership roles in both Federation and at our synagogue and we are proud to share in this partnership between the Jewish Federation in the Heart of New Jersey and our B’nai Tikvah family. Federation needs us, and we need them. So how does Federation do this? Federation partners with social service providers to assess and address our community’s most pressing needs. It provides philanthropic funding for essential programs, such as kosher meals on wheels, counseling and socialization programs, and advocates with public and private sources. To date, Federation has given 131 scholarships enabling children with special needs to attend summer camp tailored specifically for them and helping them to form a bond with their camp family. Federation has also made it possible for more people to experience Israel first-hand by providing teen grants for summer programs and supporting Birthright Israel trips for young adults. And this October, 250 participants will travel to Israel on a community-wide mission. In 2018 Hebrew Free Loan made 10 times more loans than in each of the three previous years. One such loan entitled Building Jewish Families – is an interest-free loan defraying the cost of adoption, fertility treatments, and surrogacy for families looking to raise Jewish children. Federation was instrumental in bringing the Shinshinim program to our community. Two Israeli high-school graduates, Maya and Dana, have chosen to defer their military service for a year in order to serve abroad. (You may have met Maya here on Rosh Hashanah.) They are conduits for Israel education by creating dialogue, promoting tolerance and strengthening Jewish ties between Israel and the Diaspora. They help young Jews to develop a strong and meaningful attachment to Israel and to enhance their Jewish identity. The Jewish Federation takes the safety and security of our community very seriously. In the last two years, Federation helped attain more than $3 million from Federal and State grants, as well as their own investment, for security upgrades, to 49 different local Jewish organizations. And Federation stepped in to help fight against anti-Semitic incidents in East Brunswick, in Red Bank, at Rutgers University and elsewhere in our local area. Federation also sends approximately $500,000 overseas. This money supports teens at risk and the impoverished elderly. It ensures integration of newly immigrated individuals and families into Israeli society. And Federation provides vocational training for young people with disabilities and funds work experiences for needy adults, and so much more. As a way of helping each Jewish organization secure its own future, Federation won a competitive grant from the Harold Grinspoon Foundation to bring the Life & Legacy program to our community. It invited every synagogue and Jewish institution in our area to participate. This program trains and supports organizations like B’nai Tikvah to secure endowment gifts, which are then invested to support B’nai Tikvah’s future. To date, the Life & Legacy initiative has secured $11 million in estimated future value from 408 gifts to 16 organizations in the heart of New Jersey. In addition, participating organizations have earned a total of $200,000 in cash incentives that can be used now to further their missions. Through the Life & Legacy program, we have solicited 37 endowed gifts with a future value of $856,825 and we received $17,500 in incentive funds to be used today as we see fit. Security funds of $152,500 have been given to us from Federation and Federal security grants. Federation has provided $6500 towards our community programs. Several teens received $1000 grants towards their peer Israel experience. Six youngsters received grants of up to $1000 towards their first Jewish overnight experience. Families in need were able to afford day camp through need-based camp grants. Shinshinit Maya will spend 8 hours a week enhancing our educational programs with Israel-related activities and will participate in some of our synagogue events. Members have access to ZERO-interest loans to help them get by in times of hardship, start new businesses or to expand their families through adoption or surrogacy. 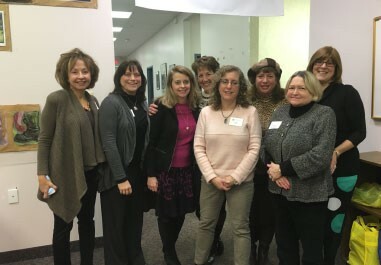 Our early childhood and Hebrew school teachers attend Jewish educational workshops and conferences. Our teens are among hundreds of volunteers throughout the community participating in the International Day of Youth Service. I hope you agree that these programs are all meaningful and worthwhile. This year our Federation hopes to raise about $3 million in annual campaign donations. That is a good start. But, it’s not enough to enhance security for every Jewish gathering place. It’s not enough to keep every vulnerable person fed, safe and warm with dignity. It’s not enough to continue fighting anti-Semitism. And it’s not enough to invest in a thriving Jewish community for generations to come. So, think for a moment how much more our community and our partnership with the Federation could accomplish if everyone makes a contribution to Federation. Please respond to Federation’s High Holiday appeal letter. If you haven’t received one, you can donate on their website or contact the Federation directly, and please be as generous as you can. Thank you very much for your attention. From the Schwartz Family to all of you – we wish you a sweet New Year filled with health, happiness and peace.